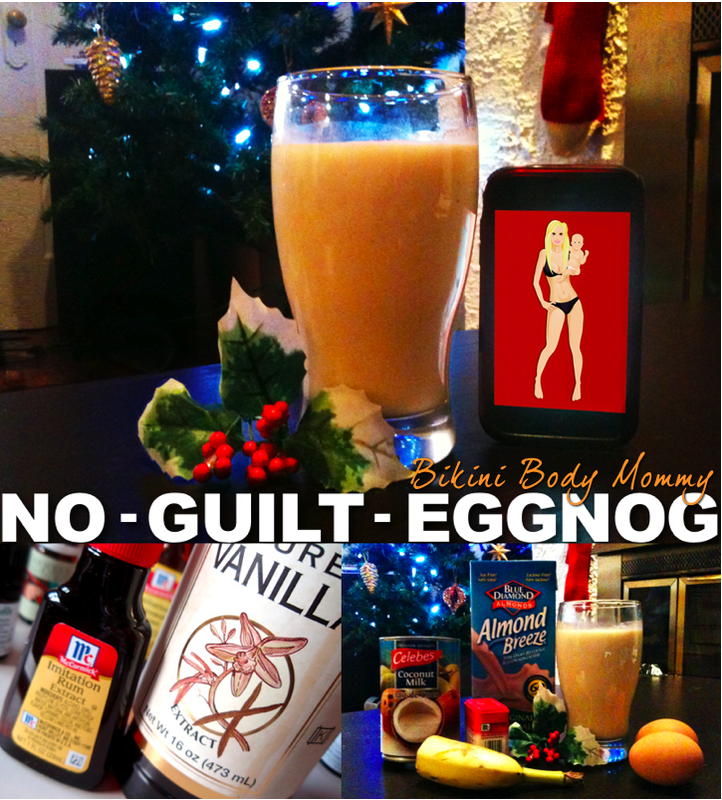 BIKINI BODY MOMMY™ — No-Guilt-Nog! There are certain drinks that are synonymous with the Christmas season... The first one that comes to mind for me, is Egg nog! Unfortunately, this creamy holiday beverage is traditionally very high in fat and sugar, and it is often made with rum -- which only adds to the already high calorie content. Well not to worry, my little Egg nog lovers -- I have a solution! If you happen to love the flavour combination of vanilla, nutmeg, and rum as much as I do, but aren't crazy about gaining weight during the holidays -- then my Bikini Body Mommy NO-GUILT-NOG recipe is for you! I make mine with rum extract, but if alcohol is a must for your holiday party this weekend, you can swap the extract for rum to make it a "Christmas cocktail." If you are pregnant, currently breastfeeding, or plain just aren't a fan of drinking raw eggs (Let's face it, who has time to risk getting sick with salmonella during this time of the year?!) *Substitute the raw egg yolks and banana, with 1/2 cup of Fat-free vanilla pudding. The consistency and sweetness will be exactly the same as the original! 1. In blender, combine 2 egg yolks, and vanilla. 2. Next add coconut milk, almond milk, and nutmeg. Blend until well combined. If you’re using protein powder, add now and blend until smooth. 3. Next add banana. Blend until it reaches the desired consistency. 4. Pour, sprinkle with cinnamon, serve, and enjoy! ***For the alcoholic variation, reduce the coconut milk to 1/4 cup, and add 2 oz. of your favorite rum. Newer PostMake 2013 the year of YOU... Setting Goals & Being Brave!